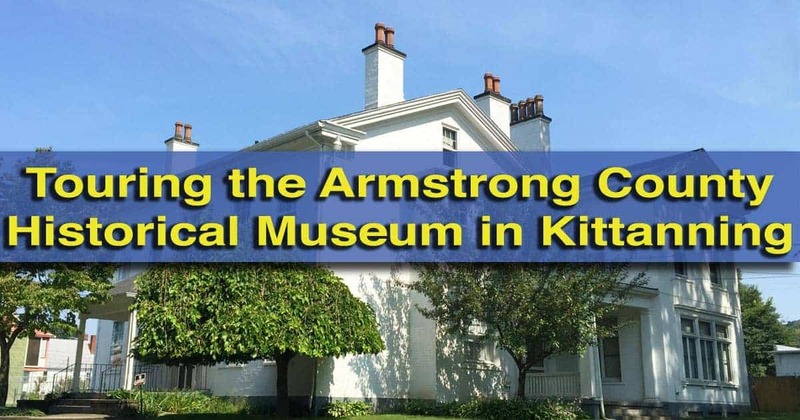 Located on a small knoll on the outskirts of Kittanning is one of Armstrong County’s most historic homes. Built in the 1840s, this building, known today as the McCain House, served as both a home and a school, before being turned over to the Armstrong County Historical Museum and Genealogical Society. Today, the home serves as a great example of 19th century life in western Pennsylvania and a fantastic place to learn about the history of Armstrong County. Visits to the McCain House start on the first floor, which is set up much as a home from the mid-1800s would have looked in the region. This is especially evident in the kitchen, parlor, and foyer, which have been restored from their 20th-century updates back to a more authentic historical feel. In addition to the well-preserved period furniture, the first floor has two very interesting items hanging on the walls. In the parlor, there is a large painting done in 1878 by George Hetzel, a famous artist from the Pittsburgh area. The painting features an overview of Kittanning from a nearby vantage point and gives a great point of reference for the growth of the town over the last 100+ years. Despite its beauty and famous creator, the painting was discovered in the attic of the home during restorations. The Armstrong County Historical Museum does a great job showcasing local history. Another interesting piece is a beautifully preserved map of Armstrong County from 1861 in the home’s foyer. This map not only showcases the county’s townships and boroughs, but also features the names of many of the county’s landowners, making this piece interesting for both map enthusiasts and those who had family in the area at that time. The last downstairs room features a very large collection of antique postcards from all over the world. While they might not feature local scenes, they provide a glimpse into what people would write to their friends and family in Armstrong County in the distant past. This room also contains information on Nellie Bly. Bly grew up in Cochran Mills (now Burrell Township) and was one of the first women to become an investigative journalist. She is best known for faking insanity to cover an insane asylum from the inside and traveling around the world in only 72 days. 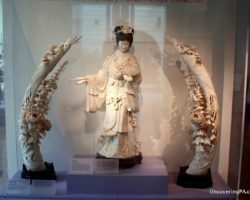 While I would have loved to have seen more information about her, what the museum had was quite interesting. This room also features a visible typewriter invented by Daugherty Typewriter Company in the 1890s. This typewriter was considered the first modern typewriter and was the basis for the design of many of the typewriters used in the 20th century. Upstairs, the home features a variety of exhibits spread throughout the different rooms. 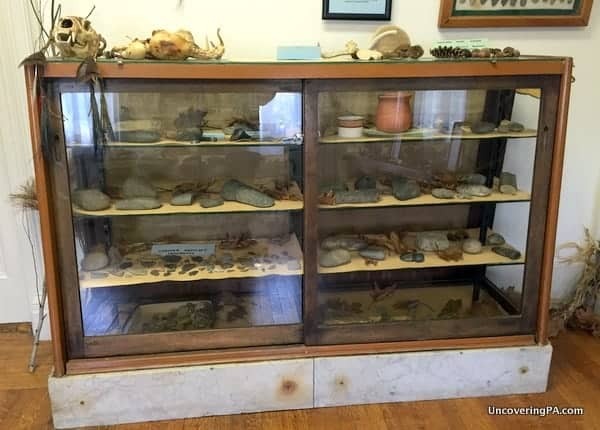 In one room, there is a very large collection of local Native American artifacts. This collection of pottery, arrowheads, other tools is one of the largest I’ve come across in Pennsylvania. The room also features reproduced tools and the walls are decorated with petroglyphs that are copies of those found throughout the county. A display case showcases a small percentage of the museum’s Native American artifacts. Another room upstairs features a variety of items related to Armstrong County veterans from the Civil War through the Korean War. 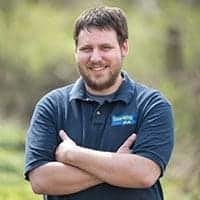 While the exhibits here aren’t significantly different from those found in many other historical society museums in Pennsylvania, they do offer a great glimpse into military history and the lives of local veterans from a variety of conflicts. 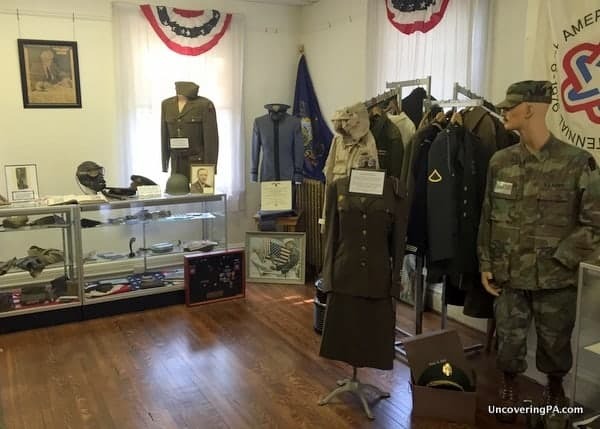 Military items on display at the Armstrong County Historical Museum. 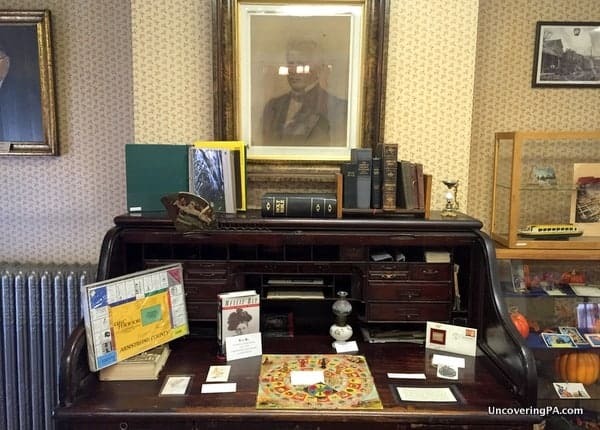 Without a doubt, the highlights of the Armstrong County Historical Museum were the exhibits on Nellie Bly and the Daugherty Typewriter, along with the museum’s great Native American collection. 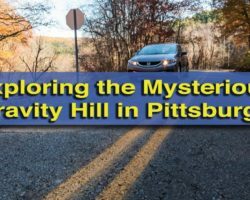 If you can work their limited hours into your schedule while visiting Armstrong County, Pennsylvania, this is certainly a museum to consider stopping by. 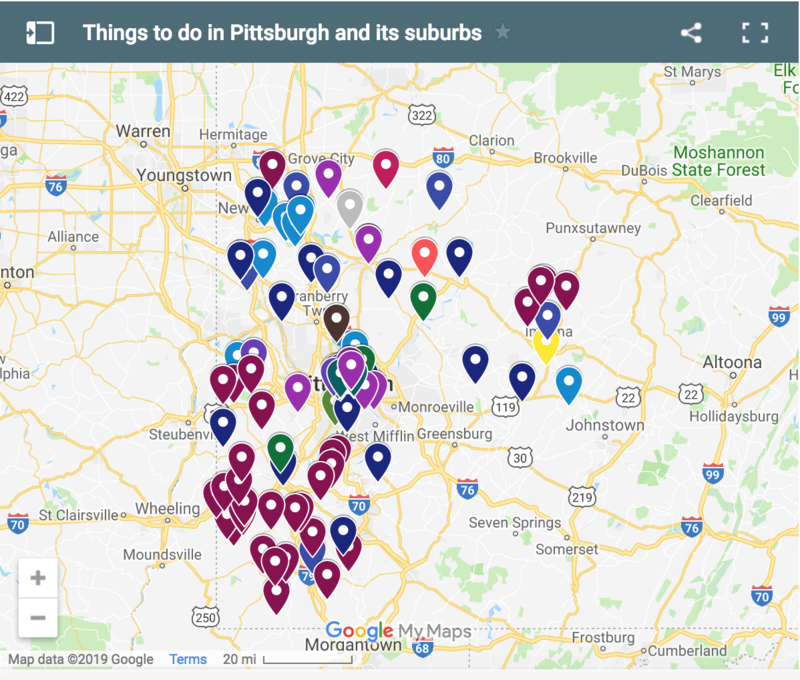 While it might not have many exhibits with extraordinary significance outside of western Pennsylvania, there is enough here to make a stop worthwhile for any history buff. 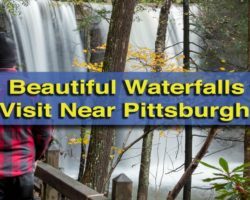 Looking for more great places to visit in the area? Check out the Saxonburg Museum, the nearby covered bridges of Indiana County, and the Mardion Museum. Note: My visit to the Armstrong County Historical Museum and Genealogical Society was hosted by the museum. However, the opinions expressed are my own. you have the times wrong. we are opened every Thursday 12-4. The first Sunday is correct. We are closed Now through April 2016. Co-curator Armstrong County Historical Society. My dad who would be 109 now if still living grew up in Armstrong co until about age 12. He always talked about an old town up on the hill above Kitaning called Brocketville. I dont know if the town is still there or not. Are there any old photos of Brocketville? I don’t have access to any, but you could contact the historical society to see if they have any. Can’t wait to visit this museum when we come in the fall (we are from Beaumont, California). It will be our third trip to the state, but don’t believe we have ever been to this historical Society Museum in Kittaning. My second great grandfather was Francis Johnston and his son was Curtis Johnston and daughter Annetta “Johnston” Fishel. Am hoping to find some living relatives and spend time in this part of Pennsylvania. So excited to really see this area and perhaps spend a week or more just there. Will be looking to hire someone who really knows Kittanning as well as the history of the town for the time we are there. You folks truly live in one of the most beautiful spots my husband and I have ever seen! See you in early fall! Hard to tell if there is a connection. Please post dates and locations where people lived or were born. Francis R. JOHNSTON was b. 1817 in OH from a JOHNSTON family who lived in-near Kittanning, PA. This Francis JOHNSTON was named after a Francis ROBINSON, whom you will find mentioned in Westmoreland Co., PA histories. An uncle of Francis JOHNSTON, David JOHNSTON, was a lawyer in Kittanning and is often mentioned in Armstrong Co. PA histories.